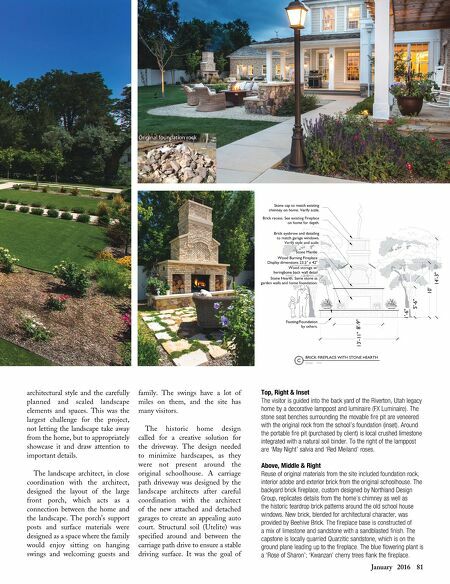 January 2016 81 architectural style and the carefully planned and scaled landscape elements and spaces. This was the largest challenge for the project, not letting the landscape take away from the home, but to appropriately showcase it and draw attention to important details. The landscape architect, in close coordination with the architect, designed the layout of the large front porch, which acts as a connection between the home and the landscape. The porch's support posts and surface materials were designed as a space where the family would enjoy sitting on hanging swings and welcoming guests and family. The swings have a lot of miles on them, and the site has many visitors. The historic home design called for a creative solution for the driveway. The design needed to minimize hardscapes, as they were not present around the original schoolhouse. A carriage path driveway was designed by the landscape architects after careful coordination with the architect of the new attached and detached garages to create an appealing auto court. Structural soil (Utelite) was specified around and between the carriage path drive to ensure a stable driving surface. 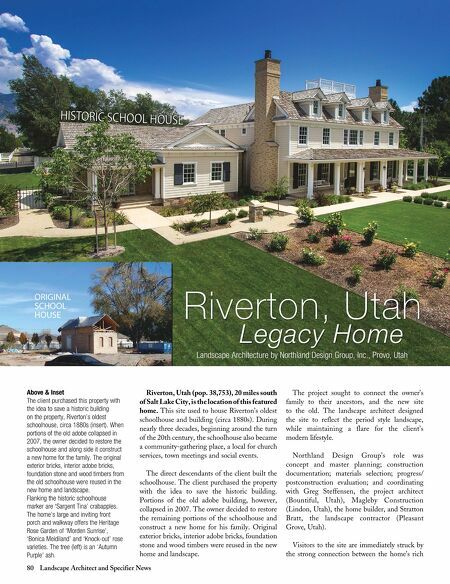 It was the goal of Top, Right & Inset The visitor is guided into the back yard of the Riverton, Utah legacy home by a decorative lamppost and luminaire (FX Luminaire). The stone seat benches surrounding the movable fire pit are veneered with the original rock from the school's foundation (inset). Around the portable fire pit (purchased by client) is local crushed limestone integrated with a natural soil binder. To the right of the lamppost are 'May Night' salvia and 'Red Meiland' roses. Above, Middle & Right Reuse of original materials from the site included foundation rock, interior adobe and exterior brick from the original schoolhouse. The backyard brick fireplace, custom designed by Northland Design Group, replicates details from the home's chimney as well as the historic teardrop brick patterns around the old school house windows. New brick, blended for architectural character, was provided by Beehive Brick. The fireplace base is constructed of a mix of limestone and sandstone with a sandblasted finish. The capstone is locally quarried Quarzitic sandstone, which is on the ground plane leading up to the fireplace. The blue flowering plant is a 'Rose of Sharon'; 'Kwanzan' cherry trees flank the fireplace.